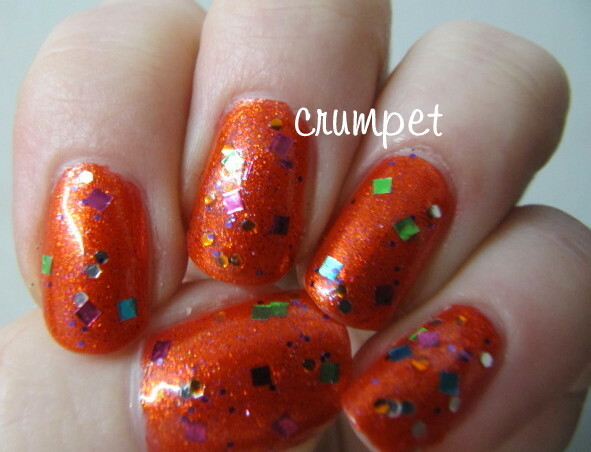 The Crumpet: Best of 2012 - Polishes of the Year, Part 2 aka the Indies !! 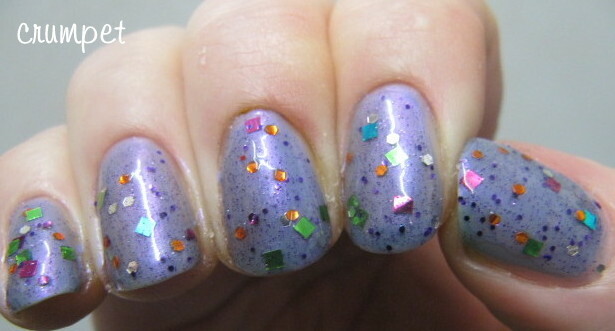 Best of 2012 - Polishes of the Year, Part 2 aka the Indies !! So here we have the 2nd half of my favourite polishes of the year - the indie half :) I have to admit, I bought WAAAAY more indies than mainstreams this year, but in the end, this wasn't as hard as I thought it would be, mainly because I duped myself a lot and recycled a lot of them through my blog sale. First of all, you're not going to see 2 very important polishes in this post, and I want to explain why. For me, no other polish had the impact that Floam had in 2012. To say everyone went shitnuts for it is an understatement. It was created by Amy, but is now licensed to Ninja Polish who have made some awesome variations. Why is it so important ? Because, in the immortal words of Phoebe Buffay, "what the hell is this crap?" Lol, and I mean that affectionately. A matte glitter ? Glitter that does NOT shine ? Seriously ? Yup, seriously. 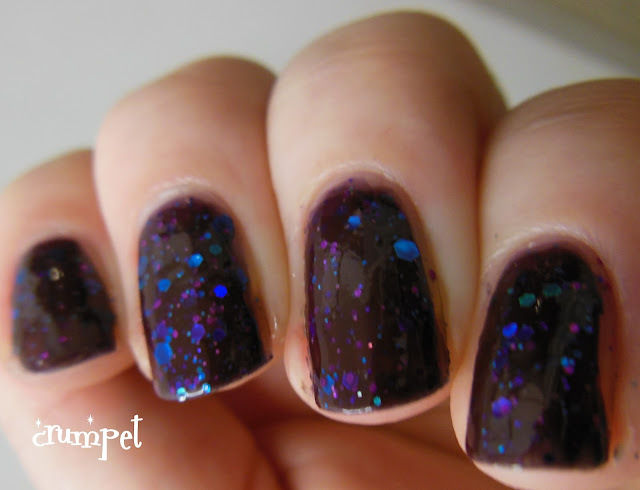 And once Floam was unleashed, everyone started experimenting with matte glitter, and I do believe our polish choices are all the better for it. Why isn't it on my list ? Because it took me 48 minutes to take it off. Maybe in these PVA times I should reconsider, but ... scarred me, it did. 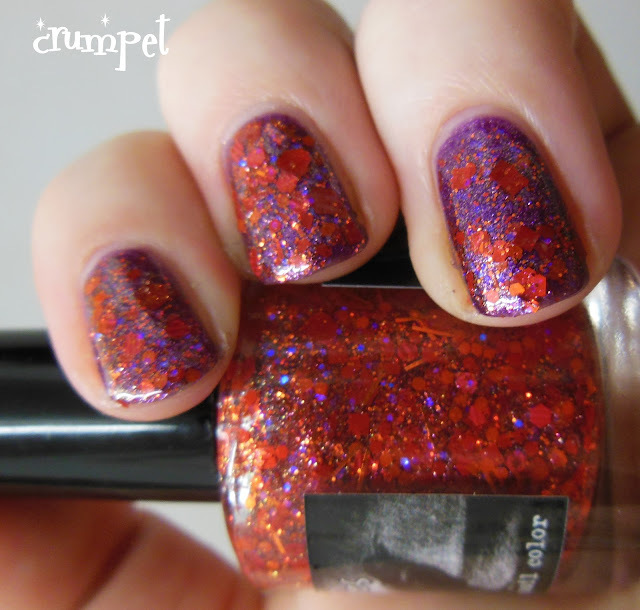 The 2nd polish you won't see in this list is the white polish with coloured glitter. A trend started by Pretty and Polished's Jawbreaker, and perhaps most popularised by KBShimmer Oh Splat, EVERYONE released a white glittery polish this year. I think they look great .... as long as they're not on me. 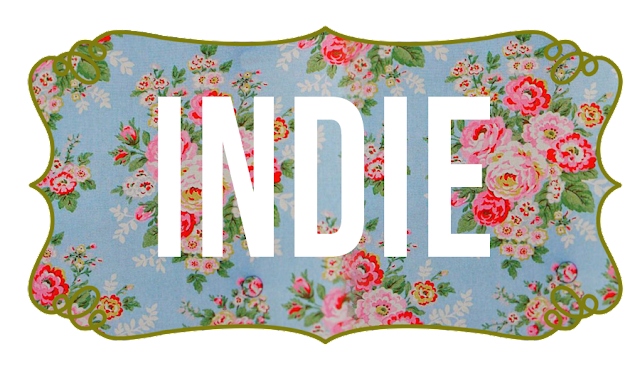 And then the final caveat - as I mentioned in my Fave Indie Polish Maker post, I've bought so many bloomin' indies that I haven't been able to try them all. That means that in this post, you won't see Nail Pattern Boldness, Nail'd It, Shimmer, or any of the other fabulous brands. I will wear them soon, but for now I can only stroke them in the bottle. Ok, is ya ready and does you have popcorn, cos this is going to be fun !!!! An orange holo you say ? What's that, a PERFECT orange holo ?? Oh yes, oh yes. This is an absolute belter. Just wow in every way. Ah I love this, it could have been made for me! The only thing that stops me loving it more is that other than the obvious red, black, white, silver / grey, I get stuck on what to layer these red / black / silver glitterbombs over. Maybe I just need to go mental !! I was so excited when I placed my first Rainbow Honey order, and in the end, this was the only one that really grabbed me (that I tried, there's er still some on Mount Vesuvius in the corner). This is a fabulously deep and murky shade of orange, and it's the colour more than the glitter that wins me over. Ninja Polish, as well as being a fab stockist, started making their own polishes this year, and this aquatic stunner was my favourite. It's like diamonds in the Bahamas. There were almost more KBShimmers in this Top 10, and to be fair, I loved Don't Teal Anyone just as much. So you get both photos, cos I'm good like that. 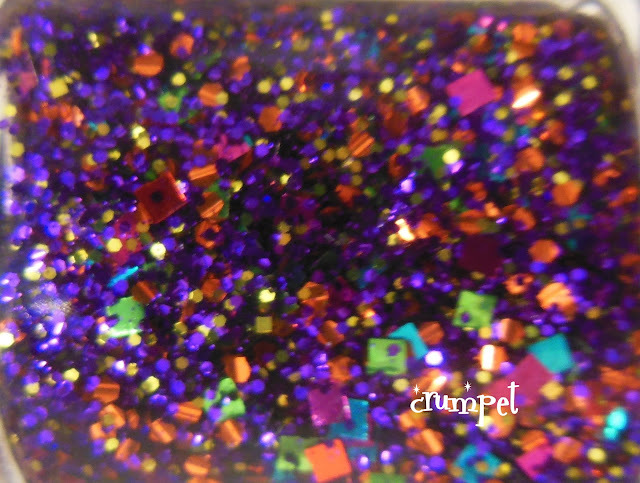 No, not Muy Caliente as many of you will have expected, but this, the perfect purple, red and black glitterbomb. Truly breathtaking. I wore this as my birthday mani. 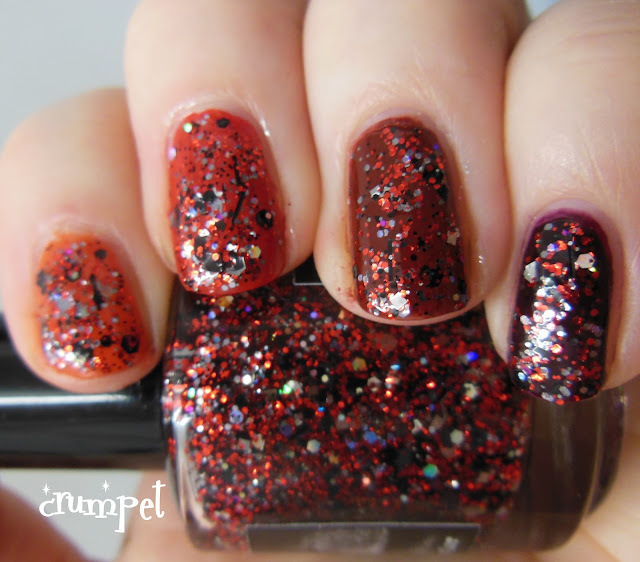 The only indie to get 2 polishes in my Top 10, the Crows Toes Halloween collection was twisted and transcendent. This orange and purple outrage was my garish favourite - I'm going to have a lot of fun with this in the summer. Hot hot hot. I can see me wearing this polish out. Basically, this is Zoya Kelly, but better, and it's also pretty much the colour of Bluebelle :) I was reluctant to buy more of her polishes as they were *just* cremes, but now I wish I'd bought them all. Just look at that shimmer! I still remember seeing this for the first time and how it took my breath away. This was going to be the winner til I realised another polish was NOT released last year lol. Super bright, cheeky, cheerful, childish - wow, so playful, so wonderful. It's glitter, and it's squares !!! Square glitter !! I bought this polish in the Spring, but thought it was one of Dolly's older polishes. I was delighted when she told me it had been released this year, because frankly, there's no polish that makes me happier. In a year when I bought too many indies, especially glitter toppers, this is one of the few / none that I have worn more than once, AND I have back-ups. Plural.